The National Institute for Direct Instruction (NIFDI) has developed video guides to accompany the training and support videos available on this website. These guides were initially developed to help viewers focus on critical aspects of the full immersion model of Direct Instruction (DI) presented in the videos. Just as DI programs are field tested, these guides have also been designed and tested to ensure they target key aspects of implementation pertinent to successful DI implementations. They help guide conversations of faculty and schools contemplating implementation of the full immersion DI model. For schools or districts already implementing DI, it provides an opportunity for discussion among teachers and staff regarding critical issues associated with implementation and is perfect for a structured inservice. Questions or feedback about the video guides should be sent to . 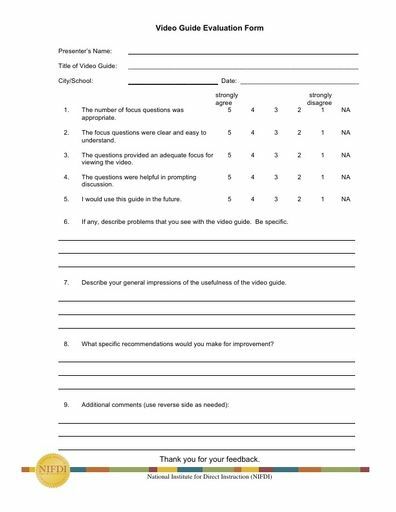 To provide feedback, please use our pdf Video Guide Evaluation Form . We welcome your feedback! If you have comments, questions or suggestions regarding the guides, please send us a message at .